The personal blog of my MFA thesis journey, consists of diagrams, system maps, frameworks of Information Architecture, and early prototypes. How could design bring more smiles into daily life? Smart smile is a smart switch that could be attached to electrical appliances. Communicating with the smart wall plug, Smile Switch could turn any kind of appliances to smile-triggered systems. For instance, you can make a cappuccino by smiling. It provokes users to smile more often. According to the facial feedback hypothesis facial expression could change how we feel. Smiling is a powerful tool to reduce the stress caused by an upsetting situation. It's a mindset and a choice that one makes to decide how to approach to a circumstance. Could objects be a reminder of this gesture? It's an explorational project. 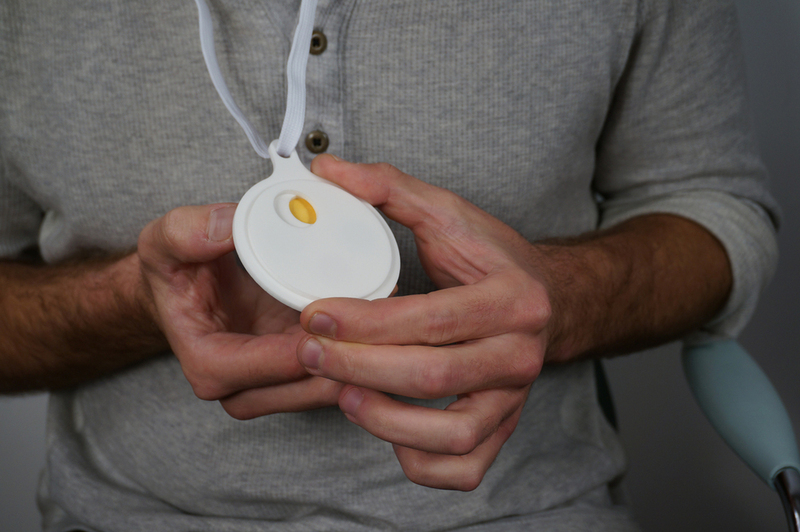 Emotion necklace helps patients, doctors and hospital staff to visually express how they feel in order to understand each other and have a better communication. Using a color code system provides a quiet design language without embarrassing the users. Each color translates to a certain feeling such as anxious, angry, grateful, tired, confused. The concept emphasizes the importance of empathy in the context of healthcare. After imagining a device that would provoke its users to laugh, I decided to prototype this idea very quickly in order to try it with real people. With the original rendering that I made (the first image) my aim was to dream a collaboration between Philips Healthcare, Jimmy Kimmel and Memorial Sloan Kettering Cancer Center. The purpose of this collaboration is to provide patients with a magical headset that makes them laugh as they use. Emphasizing the important health benefits of laughter , the idea is to bring laughter as a therapy to the cancer patients, most of who suffer from depression due to cancer related experiences. In order to test the concept, I downloaded Google Cardboard layout from Google, then I manipulated the size and the shape to create a different experience. Afterwards, I chose several entertaining and funny videos such as cats and laughing baby videos. Then, I opened these videos on my phone and placed my phone into the cardboard prototype. I tested the prototype with approximately 10 people from different ages ranging between 24-32. Similar initial reactions were; excitement to engage with the product, dropping the chins, disassociating self from the physical environment, engaging with the stimuli at a high level. Some of them expressed their feeling as "being in a movie theater", "forgetting where actually I am." These observations showed that the laughter device would actually make people laugh. Therefore, hypothetically doctors could prescribe "laughter" to their patients. Next step is to test it with patients in clinics. This week I am meeting with a physical therapist in order to explain the idea and kick off the patient test. 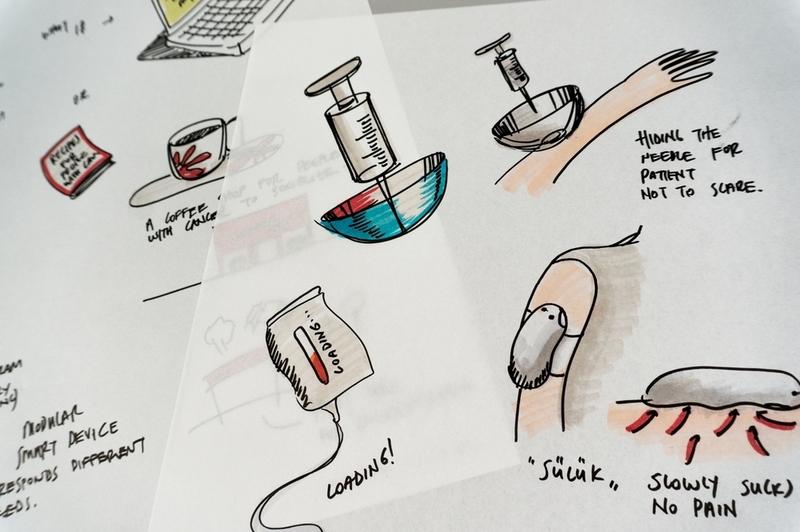 Smooth Syringe is one of the speculative object concepts developed to question and re-think the existing experience of going through frustrating healthcare experiences. Asking the question of "What if the syringe was not that scary? 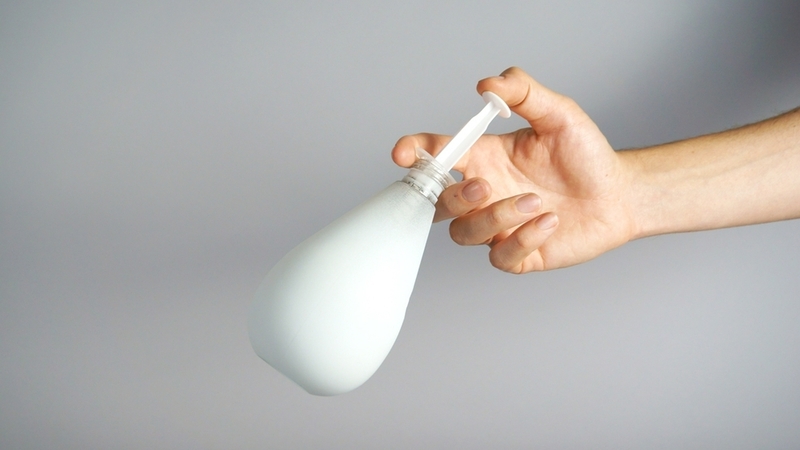 ", Smooth syringe concept was developed to change the perception about syringe. 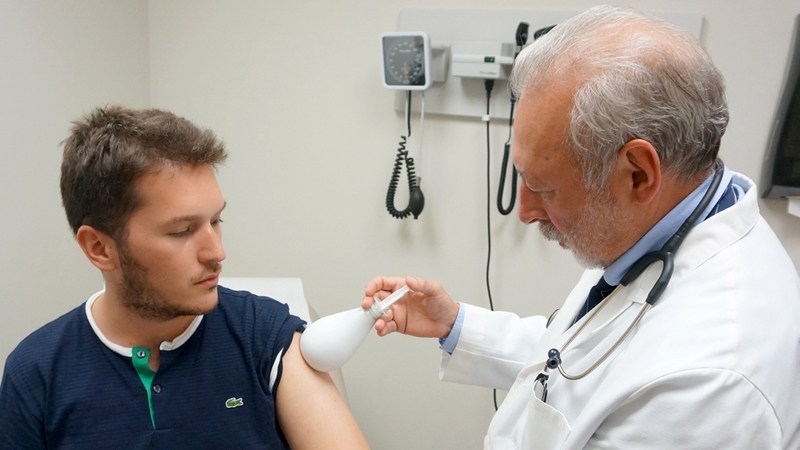 It hides the needle by showing a smooth and harmless shield to patients. methodology, which is an important and helpful method for generating as many ideas as one can, exploring different territories and different opportunities in healthcare became much more convenient. Lateral thinking is a method invented by Edward de Bono, who is the author of the “Lateral Thinking” book which teaches how to be open minded, more creative and playful to generate more ideas easily. In his book he talks about looking to things differently and opening all the receptors in order to see as many opportunities as possible. According to Bono it is essential to unleash the mind and play with numerous “irrelevant” concepts irreverently. By having no limitations and no fear, one can easily come up with tons of ideas, most of which will probably sound like silly and nonsense. However, as the journey goes on, magic happens and unthinkable ideas occur one by one. It is very surprising to see how human brain loves being creative and playful and doesn’t prefer judgmental comments at this phase. This could also be observed in kids’ behaviors. They don’t have the fear of making mistakes. They play, they ruin, they do silly things but at the end they surprise adults with their magical creativity. if the tools were less scary? What if the doctors were friendlier? What if the needle was not sharp? What if hospitals looked like lovely coffees? What if the newspapers only had good news? Lateral thinking method and provocative questions helped me to put my thoughts and insights on the paper. I was able to see my initial ideas and opinions much more clearly. By doing so, I realized that I was mainly playing around three main categories. The first is the interaction between the patients and the medical devices, second is the interaction between patients and doctors and the third is the relationship between the patients and their long term diseases. There are many other intersections of many other elements for sure but these were the ones that came to the surface. her patients and doesn’t respond their needs will probably cause a terrible experience. Empathy is an essential tool in order to build bridges. It is not fair to expect from doctors to be patient and calm all the time while they are having extra-ordinarily busy days with no sleep. On the other hand it is also unfair to expect from patients not to depend on doctor’s behaviors since doctors are the most important source of the information that they are dying to learn. The concept I develop to address this issue is a necklace that makes emotions visible through color coding. 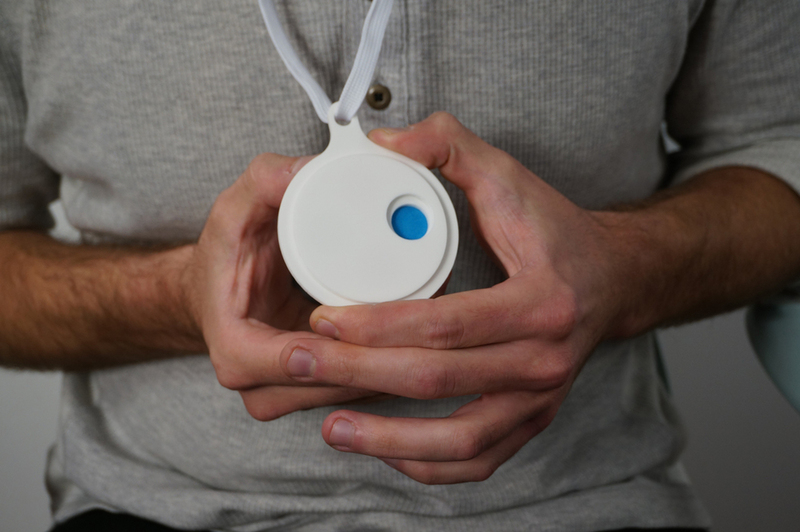 By using this necklace both doctors and patients can constantly communicate their emotions to each other. Finally, the third issue is the relationship between patients and their long term illnesses. Some diseases are acute, some are chronic and some are unimportant whereas some are fatal. There are many people in world who have to live with very bad diseases for the life time. Mental wellness and emotional support become much more essential in these scenarios. For instance a cancer patient who is dealing with tiring and exhausting treatments crave for love and support. Communicating with family and close friends become much more important. On the other hand, hearing and seeing bad things, bad news, and tactless comments might affect them terribly. Third concept focuses on this issue, re-thinking a newspaper for mentioned type of users. The concept is a special newspaper called “The New Your Times” which is curated by the New York Times. The purpose of the New Your Times is to filter the bad news and deliver the good news to patients. Good news might be from all around the world and from patient’s social environment such as his/her friends, family, partners, co-workers, etc. By creating a platform that only delivers the good news, the intention of the concept is to celebrate the life and keep the morale high.